Do you like traditional or contemporary? Eclectic or modern? We offer all kitchen cabinet styles. Choose your specific wood, your favorite color, and the knobs and pulls you like best. Everything is customized just to your liking. Similar to kitchen cabinets, bathroom vanities come in all styles. You’re sure to find your dream vanity from our wide selection of styles, wood, colors, and more. Create a customized bathroom that expresses your style. Built-in cabinetry breathes class and high-end into any space. Whether you want built-ins in your dining room for an upscale look or in your family room to flank and frame your fireplace, we can help you get the exact look you want. Commercial cabinetry gives your office or facility a professional look while offering functionality. If your space needs cabinets or shelves, we can help you design, build, and install the perfect commercial cabinets for your company. Contemporary cabinets are what’s stylish today, but they may borrow from design predecessors. If you want a clean, spacious look, contact us for a consultation or visit our impressive show room. Traditional cabinets use warm colors and symmetrical lines. This is perhaps the most popular style for decorating your home. It uses design elements from several centuries for a comfortable, elegant look. Country cabinets are warm, comfortable, and inviting. It’s a timeless style with a natural appearance. We offer specific cabinetry to complete the signature country look. Call today for a consultation or visit our amazing show room. Modern cabinets have an angular, asymmetrical, or curved look that is clean and stylish. Materials are often man-made, like stainless steel, glass, metal, plastic, concrete, and more. See a modern kitchen at our show room. Eclectic cabinets might partner a painted white upper cabinet with open shelves, sleek wood-grain base cabinets, and wood or white countertops. Consider expressing your own particular style with eclectic cabinets creations. Natural and stained finishes bring out the wood’s natural grain, with color being secondary to the wood’s patterns. These finishes are traditionally hand-rubbed for a crafted, customized look. Thermofoil is a highly durable alternative to wood or painted cabinets. Featuring molded, one-piece doors, you get an antibacterial surface that’s very easy to clean. Interiors are white to match the door’s back. Laminate finishes are an affordable collection of finishes that offer real wood characteristics with a durable, long-lasting product. Choose from a unique wood grain, a cool white high gloss, and more. Painted finishes are wonderful for a light, clean look or for matching the colors and decor in the rest of your home. Some of the wood’s natural grain may show through, offering interesting texture. The finishing touches on your new cabinet project can really set your project apart. Selecting the “right for you” handles and pulls means matching the rest of your decor and home styling. Choose from 100s of available styles. We also offer 100’s of unique knobs for your cabinets. Made from various materials including metals, porcelain, bone, wood, and more, you’ll be able to find exactly what you want. Come into the showroom to explore options. From trendy to traditional and everything in between. 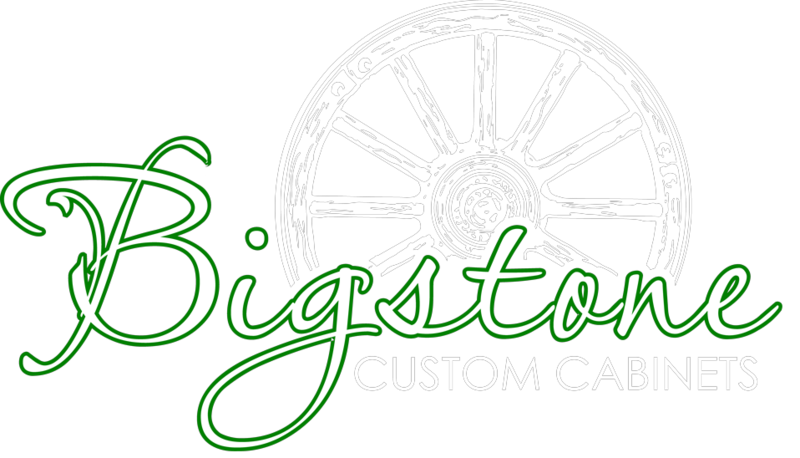 Bigstone Custom Cabinets provides options for your cabinet hardware that will fit your life and home. We even offer materials perfect for children or accessible living. Some of the biggest advancements in cabinet technology comes from the storage accessory manufacturers. With options ranging from special slide out storage, to built in spice racks, pull out “Lazy Susan’s, and so much more. Bigstone Custom Cabinets can create custom convenience accessories perfect for your life. From wrapping paper/fabric holders, and other hobby accessories, to pull out step-stools or under counter TV mounts. Tell us your dream and we’ll make it a reality. Keep your drawers organized with built in cutlery dividers, angled spice holders, and so much more. We offer many different ways to customize your cabinet drawers to make them perfect for your kitchen, bathroom or commercial space. Imagine a pull out small appliance shelf. Or adjustable shelving that tucks away when not in use. Maybe you want a shelf that pulls down from your wall cabinet? Or maybe you’re looking for a custom enclosure. Have an idea for an accessory and not sure if it’s even real? We can help you find or create the perfect cabinet accessory no matter what the need. Contact our design team to discuss your unique project. We’ll be happy to assist you. A long-lasting and durable wood, oak is known for its distinctive grain and texture. Oak finishes well, showing plenty of character. Color varies from white, red, yellow and black based on mineral deposits in the wood. *Available in rustic oak grain as well. Maple is another popular choice thanks to its uniform pattern and straight grain. It ranges from white to an occasional reddish brown hint. The grain may be wavy or curly with dots and mineral streaks. *Available in rustic maple grain as well. Walnut is a warm, beautiful, premium wood with graceful patterns. It can range in tones from deep chocolate to a light, reddish-gray brown. Walnut is truly beautiful with a light or clear stain to enhance the patterns and its color. *Available in rustic walnut grain as well. Cherry is classic and high-end. Its rich, reddish undertones coupled with a fine, straight texture and grain make it a sophisticated choice. Over time, cherry can mature to a dark reddish color with sunlight exposure. *Available in rustic cherry grain as well. Birch has a very fine grain and is sometimes used as a veneer thanks to its lovely grain and color. It is very pale in color, blending gold and white. Birch is an affordable choice for those on a strict budget. An alternative to solid hardwood, MDF is highly durable. Made from hardwood and softwood combined with resins, MDF is heated and pressed to create a smooth surface and a consistent core built to withstand life.